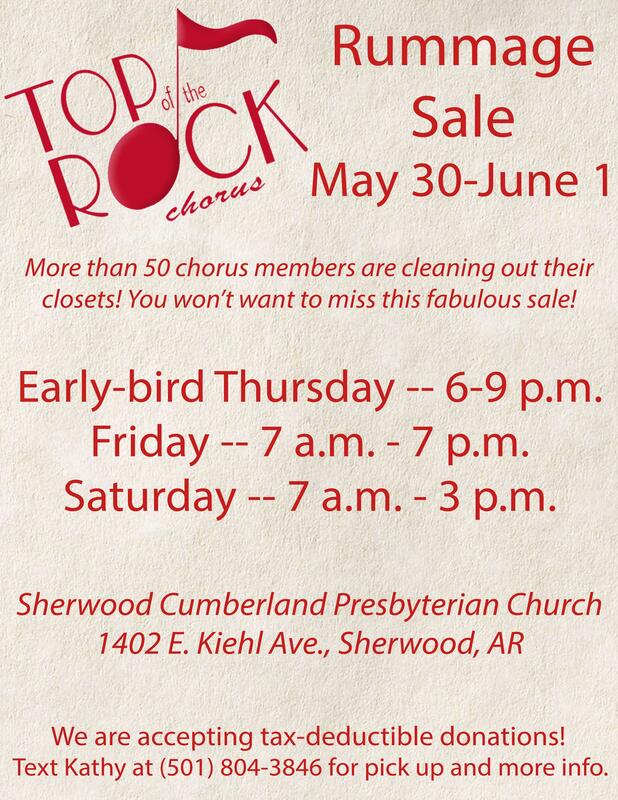 Top of the Rock is having our Spring Rummage Sale May 30 through June 1. Come see what fabulous treasures we have waiting for you -- all for rock bottom prices! Early-bird Thursday -- 6-9 p.m.
Friday -- 7 a.m.-7 p.m.
Saturday -- 7 a.m.-3 p.m.
We are accepting tax-deductible donations. Text Kathy at (501) 804-3846 to schedule a pick up or for more information. Top of the Rock performed at the Region 25 Competition on March 30, 2019, at Robinson Center in Little Rock. We are so pleased with our performance and excited that we have a video to share with you! Top of the Rock Chorus presented their “Sing Like a Girl” concert on Saturday, Aug. 4, at the Central Arkansas Library System’s Ron Robinson Theatre in Little Rock to rave reviews. The diversity of the program, as well as the spectacular award-winning quartets, was a huge hit with the standing-room only audience. The program highlighted the talents of women of all ages, including members of Top of The Rock Chorus, Peggy Gram Scholarship recipient Megan Ahne, participants in the Young Women in Harmony summer vocal program and guest quartets TITANIUM, The Ladies and Minor League. Andrea Alford, Deputy Executive Director of the Arkansas Real Estate Commission, was the Mistress of Ceremonies for the show. Top of the Rock Chorus is directed by Master Director Kelly Causey. Over the summer, Top of the Rock Chorus offered a program open to young women to encourage musical education in the barbershop art form. Tina Kneisler was the music director of the program. The participants, who named themselves the Pebbles, were featured during the concert. Thank you to Emily Armstrong, Gracie Armstrong, Abby Ellis, Callie Messick, Beatrice Nkunga, Clara Principe, Riley Rennels and Sofia Theodore for your participation. Ahne is the first recipient of the Peggy Gram Scholarship, awarded each year to an individual pursuing music at the secondary level. She is a 2018 graduate of the University of the Ozarks and will pursue a graduate degree at Bowling Green State University in Ohio. Her dream is to become a professional singer. TITANIUM is a Dallas-based quartet currently ranked sixth place in the Sweet Adelines International Quartet Competition standings and was awarded the 2018 Novice Quartet Award, given to the highest scoring quartet with at least two members competing at the international level for the first time. They will be competing at the Sweet Adelines International Competition in St. Louis in October. 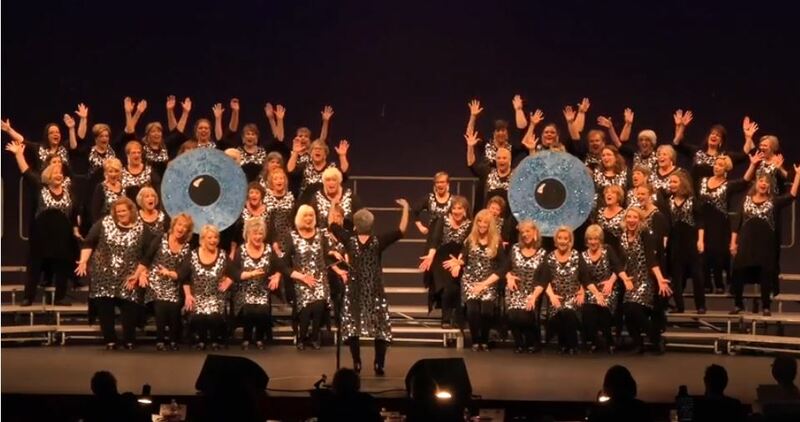 The Ladies won the 2016 Sweet Adelines Rising Star Competition for young women in New Zealand and have since performed and taught all around the country at various a cappella and barbershop camps. In March, they competed in their first Region 10 quartet competition and won first place, qualifying them to compete at the International Competition in St. Louis. Minor League won second place in the Sweet Adelines Region 25 Young Women in Harmony Quartet competition in 2018 and 2018 Region 25 Most Improved Quartet. They sing with Basically Treble Chorus in The Colony, Texas, the first Young Women in Harmony Chorus to become a chartered chapter of Sweet Adelines International. Fifteen-year-old Top of the Rock member, Reilly Principe, was featured in an ensemble called Reilly Principe and The Pretty Girls, formed to highlight her singing talent. Also performing was Top of the Rock’s own quartets and ensembles, Vertigo, Treble in the Village, Roundelay and Heart of the Rock. A sincere thank you goes to the “Sing Like a Girl” show committee and Show Chairperson Kathy Harkins for all of their hard work to make the evening such a great success. Many thanks to Only in Arkansas for publishing news about Top of the Rock! 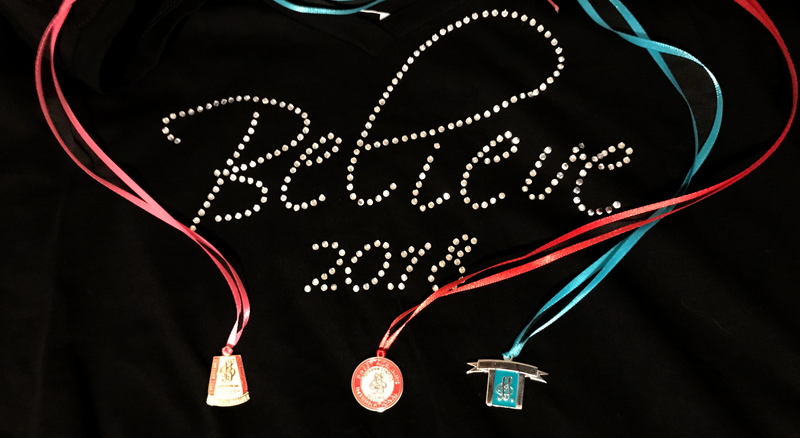 Top of the Rock had a big weekend during the Sweet Adelines International Region 25 Competition and Convention on March 23-24. Click here to see our video! Top of the Rock tied with Show-Me Harmony Chorus for Most Improved Chorus after both groups raised their scores by a jaw-dropping 26 points! Then, Top of the Rock took home second place in both Division AA (mid-sized choruses) and overall categories, finishing behind Talk of Tulsa Show Chorus. Our quartets also wowed and amazed the judges. Vertigo, featuring baritone Tamara Boggs. won fifth place in the overall quartet competition. Roundelay, featuring Kathy Allison, Mary Devine, Karen Wesson and Ellen Withers, finished 13th out of all competing quartets. Finally, the lovely ladies of Treble in the Village -- Kathy Allison, Kay Crews, Sharon Gardner and Patty Van Cleave -- won the Audience Choice Award in the quartet open division category. We want to give a big Congratulations to the three winners of our Rudolph's Raffle and a big Thank You to our generous sponsors! 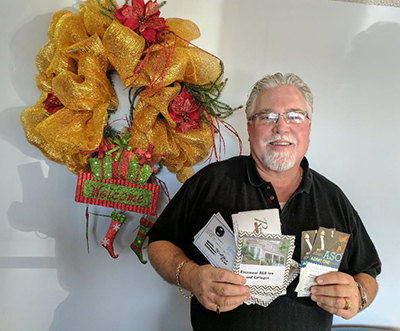 John Stark of Sherwood -- Rudolph's Raffle Winner of the Little Rock Package of a night's stay at the Rosemont B&B Inn and Cottages, dinner at Marriott Heritage Grille Steak and Fin Restaurant, and two tickets to the Arkansas Symphony Orchestra. 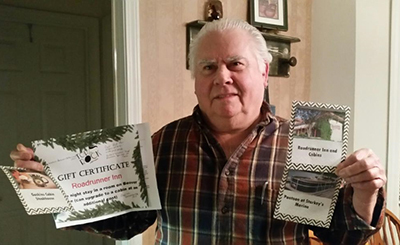 Carroll Allison of Hot Springs Village -- Rudolph's Raffle Winner of the Eureka Springs Package of a night's stay at the Roadrunner Inn and Cabins, dinner at Gaskins Cabin Steakhouse, and a half-day rental of a 24-foot pontoon boat on Beaver Lake from Starkey Marina. 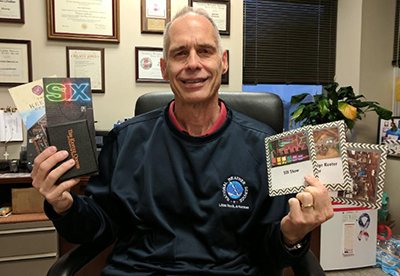 Steve Drillette of Sherwood -- Rudolph's Raffle Winner of the Branson Package of a night's stay at Mabee Lodge Keeter Center, dinner at Dobyns Dining Room Keeter Center and two tickets to the Six Show-Branson. Support Top of the Rock when you shop! Just start at smile.amazon.com/ch/71-6057058 and Amazon donates to Top Of The Rock - Sweet Adelines International. What an easy way to support TOTR! Friday's Arkansas Sounds Concert Series show leaves the instruments at the door and turns up the volume on vocals as the Top of the Rock Chorus and Acapella Rising hit the stage. 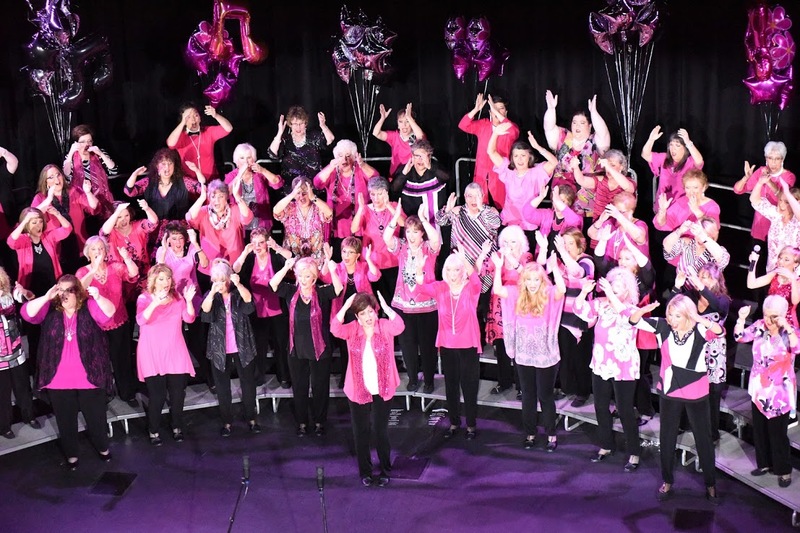 The two central Arkansas-based singing groups will each take the stage for their respective sets and then join for a finale. The concert, at the Central Arkansas Library System's Ron Robinson Theater, is the latest in the Arkansas Sounds series, a project of the Butler Center for Arkansas Studies, a department of the library system.